Angel Mist is a very fine unique fibre. It is light reflective, as well as light refractive, Angel Mist is incredibly luminescent, whilst (unlike metallic) it has an extremely soft hand. 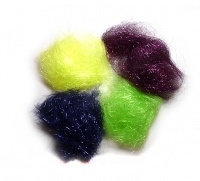 Blended with other fibres in amounts as small as 2%, it gives sparkle and highlight to your flies.